The GoPro Karma is the action camera company’s long-awaited entry into the burgeoning drone category, and it looks like good things come to those video-capturing adrenaline junkies who wait. The Karma is a well-priced drone that provides stabilized video while hovering as high as 3280ft (1,000m) and soaring at a maximum speed of 35mph (15m/s). Its 3-axis camera gimbal keeps everything steady. We didn’t crash the Karma and its GoPro Hero 5 Black ‘co-pilot’ in our first three hours of flying it at the launch event in Lake Tahoe on the California/Nevada border. And yes, we did put it to the ultimate test – in high wind at the top of a mountain. In fact, new and experienced pilots we saw aced the inaugural flight. This is helped by the fact that GoPro Karma comes with a gamepad-style clamshell controller. It’s familiar, with intuitive buttons. With its integrated 5-inch screen, the controller is unlike that for the DJI Phantom 4 drone – you don’t need an iPad to get the GoPro Karma drone in the air and see real-time video from up above. Karma folds up and fits into an included backpack, and that portability fits right into GoPro’s outdoorsy, go-anywhere ethos. Its newest mantra involves video stabilization, so it’s a bonus that there’s a way to take the drone’s gimbal, remove it and slide it into a grip for handheld video stabilization. 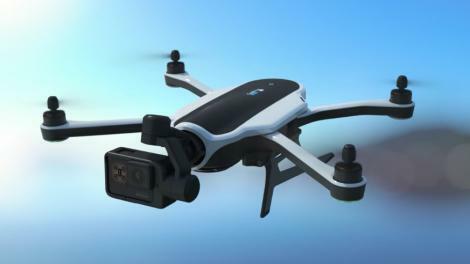 GoPro claims this is way more than a drone – and it’s right. But it’s also shaping up to be a drone done right. Let’s see where it has the most potential, despite its better-late-than-never status. Reliable drones aren’t cheap, but GoPro Karma comes in at a surprisingly reasonable price considering everything that’s including in the package. It costs $799 (£719, AU$1195) for the drone, Grip handheld mount, display-integrated controller and a backpack case. A battery, charger, six propellers and required mounts are also here. Don’t have a newer GoPro Hero camera yet? There are bundles designed just for you. GoPro throws in a Hero5 Black into the drone package for $1099, or a Hero5 Session for $999. UK and Australian pricing is coming soon. The official GoPro Karma drone release date is October 23 in the US, with other markets to follow into January 2017. The Black camera bundle is available right away, while the Session is slated for January. The other, likely worthwhile (we’re talking from experience here) expense is “GoPro Care.” It costs $149 for a two-year warranty on the drone or $199 for the drone and Hero5 Black. Replacement parts are included and damaged drones have you paying just a $199 deductible. The Karma drone is different because it’s incredibly portable. You can fold it up and stash it in a normal-sized backpack. Compactness isn’t common among premium drones like this. The four propeller arms on top fold inward and the landing gear on the bottom fold upward toward the drone body. You can take the propellers off, just in case you need a smidgen of extra space. It measures 12 in (303mm) x 16.2 in (411mm) x 4.6 in (117mm) at full wingspan, and 14.4in (365mm) x Width: 8.8in (224mm) x 3.5in (90mm) folded up. It can get small for its 35.5oz (1006g) weight. The Karma stabilizer and harness are seated up front in the drone cockpit and have a range of motion of 90 degrees, up and down. Rotating the drone is how to move the camera left and right. The stabilizer can be removed and snapped into the Karma Grip for smooth, handheld video. It’s a separate wand-shaped device with its own battery life, but it does come with the drone. The entire drone has black-and-white color scheme, with matte black landing gear legs that are really just two brackets to take on the impact of the ground first. Below each propeller arm are lights, two green ones in the front, and two red ones in the back. This is to indicate the front and back of the drone, as it can get confusing when starring up at the California sun. Taking off with the Karma drone was a smooth experience, and that’s in large part due to the clamshell controller and its 5-inch touchscreen. Pitch and yaw joysticks make this as easy as a video game, and center buttons for landing and taking off can automate everything for drone novices. Shoulder-mounted triggers are dedicated to the camera. Even on a windy mountaintop, we were able to keep the drone in the air and the on-screen video stable. The connection remained steady, which is a major problem for almost all drones we’ve tested. The Karma Controller lacks an external antenna, which goes with GoPro’s whole compactness theme, and yet it stayed connected the entire time. The only issue you have is that the 720p display has 900 nits. That’s bright enough for most conditions, but extremely sunny days, like we experienced, made it more difficult in direction sunlight. We’ll have to keep testing it to see if the so-far steady connectivity remains consistent. So far, our aerial footage looks as if it wasn’t a windy day thanks to the 3-axis camera gimbal. Popping out the camera’s stabilizer and inserting it into the included Karma Grip lets you take the camera gimbal on a handheld adventure. GoPro is basically taking a different product than drone-making rival DJI sells separately and adding it to the Karma bundle with increasing to the cost of the drone package. Locking the camera in one direction means it’ll stay trained on that direction without shake, even as you walk and turn about. Pressing the unlock button and twisting the Grip about still gives you a smooth rotation. The GoPro Karma battery life is supposed to give you a 20-minute flight before it runs out of juice and wanted to return to home. Charging it takes about an hour, according to the company. Of course, multiple batteries can be swapped in and out of the drone, and the case has space for a bunch of them, plus the controller and drone. The Karma Grip fastens to the side. There are other batteries to be concerned about. The controller is rated for four hours of use and charges back up in 2 and a half hours. The Grip lasts 1 hour and 45 minutes and charges in two hours. GoPro Karma is shaping up to be the ultimate drone for on-the-go video thanks to its compact size and it’s proven ability to provide consistent video stabilization from as high as 3280ft (1000m). It’s priced right considering it comes bundled with a touchscreen controller and handheld stabilizer. The controller makes flying fun and painless and doesn’t drain out iPad battery. There’s still several dozen more flight tests we’d like to do with the Karma drone, in a variety of different scenic environments. That has to wait for October 23. Check back for an updated review then.